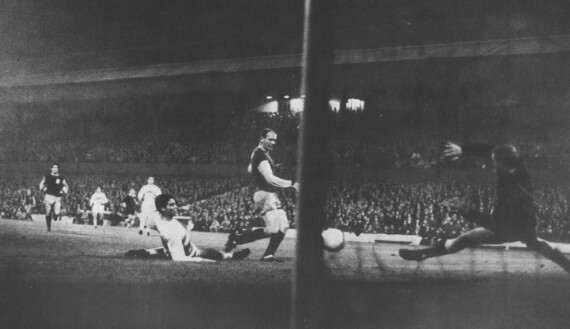 A crushing 4-1 defeat in Hamburg had seen us go out and it was the 1966/67 season before we hosted another tie in a European competition, the second leg of our Fairs Cup tie against Vfb Stuttgart, coming a week after we had earned a 1-1 draw against all the odds, and in particular the referee, in the West German city. Hopes were high ahead of the game, despite the fact that we would be without the wrongly suspended Brian O'Neil and the injured skipper Alex Elder. It was felt the Clarets, who had lost for the first time that season on the previous Saturday would be too strong for the Bundesliga club. Bob Lord had assured worried Burnley fans that there would be no price increases for the game, that Burnley would not follow the path other clubs had trodden by trying to get in extra revenue. So it was something of a surprise when club secretary Albert Maddox announced a price increase ahead of the game, an increase for most people of 20%. There was never any chance of Burnley not making it through to the last 32, Stuttgart proved to be a disappointing side and not once in the ninety minutes at Turf Moor did they have a shot at goal. Adam Blacklaw was something of a spectator. There seemed to be no logic to the way the West German side played and even once the Clarets had gone in front they continued to play with eight and nine men behind the ball as if their only intention was to keep the score down. Their style frustrated Burnley, not used to coming up against a side with little will to win, and we looked tense and anxious as the game went well into the second half with the score still at 0-0 on the night, 1-1 on aggregate. We failed to find the sort of attacking rhythm that had seen us make such a good start to the season but eventually on the hour we finally broke the deadlock. It all came from a neat link up down the right hand side between full back John Angus and the outstanding Willie Morgan on the wing. It was Angus who got the cross in and it led to Willie Irvine (the scorer in Stuttgart) and Andy Lochhead both having shots blocked, but the ball fell to Ralph Coates who stabbed the ball over the line with his right foot. That was it, the game really was all over, and we could have had many more goals. We had to settle for just one more, and it came from the move of the match. It started with Gordon Harris winning the ball just outside his own box. He moved forward to the half way line before playing the ball forward for Coates to run on to. He stormed past full back Bohringer, got down the line, and crossed for Lochhead to finish superbly. Irvine had two brilliant efforts cleared, Harris hit the bar as Stuttgart just about waved the white flag. 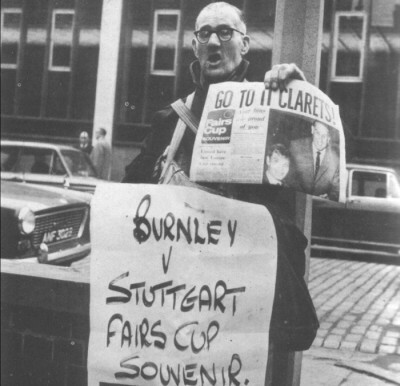 They knew they were on the way out and their President, Herr Fritz Walter, speaking at the after match banquet at a Simonstone hotel: “Burnley richly deserved their 2-0 success.” Burnley Express correspondent Keith McNee believed that to be a real understatement and said that whoever Burnley got in the next round just had to provide a stiffer test. Mr. Hollingworth did well out of it, he won the Burnley Express Letter of the Week award and collected one guinea (£1.05) – which was over four times the admission charge. Sides such as Ferencvaros, Leipzig Locomotive, Juventus, Seville, Napoli and Benfica were still in the competition as well as Leeds and West Brom and it was possible for us to be drawn against any of them. Just a couple of days after the victory Harry Potts made his way to Zurich for the draw and we were paired with Lausanne Sports of Switzerland, who somehow hadn't been able to make it to the draw. Only just over a year earlier we had played them, and beaten them 2-1, in a pre-season tournament. It had been a good week for Burnley, and a massive week for centre forward Willie Irvine. He'd scored the goal in Stuttgart and although he didn't score in the second leg he had another excellent game. Within days of the game he'd scored the only goal of the game as we beat Blackpool in a First Division fixture and then had a fixture of his own when he married local girl Rita Berry at St. Peter's Church in Burnley before holding their reception at the Sparrow Hawk Hotel across the road. They moved into a house in Eastern Avenue but by 1968 they were on their travels to the delights of Preston, Brighton and Halifax. They soon moved back to live locally and next week Willie and Rita will be celebrating their Ruby Wedding. Clarets Mad would like to send them our congratulations and best wishes. Burnley: Adam Blacklaw, John Angus, Brian Miller, Arthur Bellamy, John Talbut, Sammy Todd, Willie Morgan, Andy Lochhead, Willie Irvine, Gordon Harris, Ralph Coates. Vfb Suttgart: Pfeifer, Bohringer, Hoffman, Pfisterer, Siebold, Weiss, Gress, Entenmann, Larsson, Huttary, Reiner.